Scoliosis is a medical condition where your spine curves sideways. It’s more common in women than men and is usually diagnosed during adolescence. If you have scoliosis, you may suffer from back pain, muscle imbalance, and problems like reduced flexibility. You may also struggle to get to sleep at night, particularly if you have to wear a brace. Finding the right mattress won’t cure your scoliosis, but it will help ease your discomfort and give you a better night’s sleep. We’ve gone on a quest to research and find the best mattress for scoliosis patients and found seven top picks that will suit different sleeping positions and budgets. Sleeping in a poor position or on a saggy mattress can often make your suffering and symptoms worse. Investing in a good-quality supportive mattress can help reduce pain from scoliosis and help you sleep better. There isn’t one right or wrong position to sleep in – it comes down to what feels most comfortable for you. That said, sleeping on your stomach twists and arches your neck and spine, so is by far the least healthy option. Regularly sleeping on your front could make your symptoms worse and won’t help your posture. If you have scoliosis, it’s recommended you try and sleep on your side or back. In addition to having a supportive mattress, extra pillows or even a rolled-up towel can relieve the strain on pressure points and support your spine to help you get a better night’s sleep. Thoracic scoliosis is where the upper part of the spine curves, usually to the right. If you sleep on your back, you can relieve pressure on this area by tucking a thin pillow or towel under your shoulder blades. For side sleepers, a pillow between your knees can help keep your spine aligned correctly, and a second pillow or towel under your upper ribcage can help correct the curvature of your spine. If your scoliosis is in your lumbar region, you may be best off sleeping on your back with a rolled-up towel under the arch in your lower back. In addition to your regular pillow, you may want to place a second towel under your neck to provide extra support or use a contoured memory foam pillow. Before you buy a new mattress, you’ll need to check whether your existing bed frame is compatible. If you’re opting for a memory foam mattress, you’ll get the best out of it if you have a firm base underneath. This could be a platform or a box spring base, as long as it’s in good condition. Memory foam mattresses are also compatible with adjustable bed frames, making them a versatile option. If you have a slatted platform bed, you’ll need to check with the manufacturer, as not all memory foam mattresses are suitable for this type of frame. Generally, the best bed for scoliosis would be one that is firm but must match your mattresses compatibility. Some people resort to placing the mattress on the floor, which is fine too, provided it has the opportunity to breathe now and then. What Type Of Mattress Is Best For Scoliosis? There are a couple of things to look for when choosing the best type of mattress for scoliosis patients. If you suffer from scoliosis you really don’t want a saggy mattress. Chiropractors recommend you buy a medium-firm mattress that will support your spine correctly. That said, what’s firm to one person may be soft to another. If you’re light, then even a medium-firm mattress may feel hard, whereas heavier people may need an extra-firm mattress to get an equivalent level of support. If you sleep on your back, you’re likely to want a firmer mattress than if you sleep on your side. Manufacturers will usually give a guide to the level of support a mattress gives on a scale of 1 to 10. A medium-firm mattress will often fall between a 5 and 7 rating, with 7 or above being firm and extra-firm. It can take a bit of time to get used to sleeping on a firm mattress. We’d recommend sleeping on a new mattress for at least two weeks after buying before deciding whether or not it’s for you. Foam mattresses are a popular choice among back pain sufferers, due to their ability to conform to the precise curves of your body. Memory foam is more affordable than latex and can be better at reducing lower back pain. On the flip side, latex is more eco-friendly, lasts longer and is cooler to sleep on than synthetic foam. Foam isn’t the only option though, and many people prefer a more traditional, coil spring mattress, particularly in hot climates. You never really know whether a mattress is going to suit you until you’ve spent a couple of weeks sleeping on it. If you’re used to a soft mattress, then firmer models may feel a bit hard and uncomfortable until you’ve got used to them. Most companies offer at least a 30-day money back guarantee, but some extend this to up to 120 days, giving you plenty of time to test out your new mattress. It’s also worth checking what length warranty the manufacturer provides and what exactly is covered. For example, we found quite a variety in the depth of sagging covered by the warranties for the mattresses in this review. Possibly the best mattress for scoliosis for many reasons, the Tuft & Needle mattress shoots to the top of our recommended list due to its all-around comfort (provided by Adaptive® Foam) and competitive price point. Its two-layer design consists of a thick support layer topped by a softer foam layer that adapts to your weight and size. The more pressure you put on it, the more support the mattress provides. This means it suits a wide range of sleepers and is a great option for couples who may prefer varying levels of support. If you’re very heavy, you may find the T&N a little soft, but for most people, the Adaptive® Foam provides a good balance between comfort and support. The foam contains cooling gel and heat-wicking graphite to prevent the build-up of body heat. The cover is soft and breathable and included in the 10-year warranty, so if you have any issues with seams splitting, Tuft & Needle should send buyers a replacement. The T&N has a raft of quality and health-related certifications. You may skim over these but it’s worth noting that it’s undergone stringent testing in relation to off-gassing and VOCs. What this means in practice is that it shouldn’t give you any issues with indoor air quality. It’s impossible to know whether a mattress is right for you until you’ve slept on it for several nights at least. 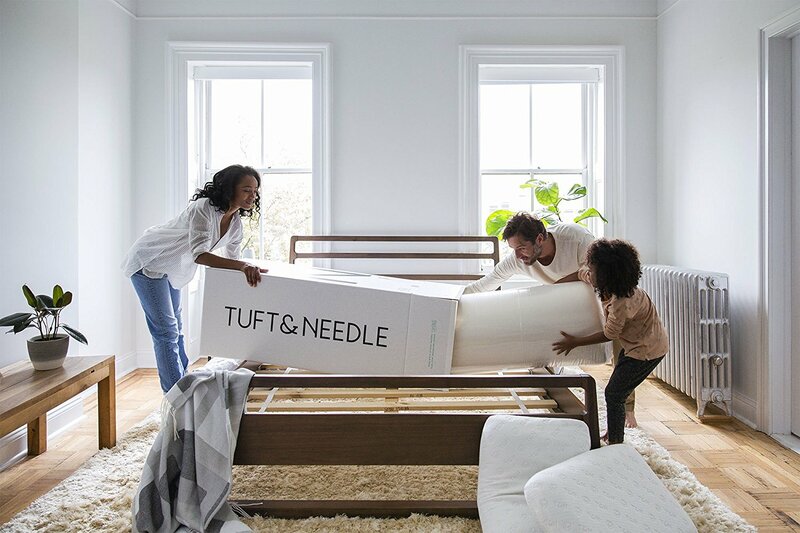 Tuft & Needle offer a 100-night sleep trial with a full refund if you find it’s not your perfect bed companion. Some users have reported that the T&N softens over time. Tuft & Needles’ warranty covers significant sagging, but the difference between general softening and sagging is a bit of a gray area. The Tuft & Needle is significantly cheaper than many of the other mattresses reviewed here, so arguably, it may not last as long. That said, there are many happy sleepers who’ve been using it for years. The good news is, if you do have any issues, Tuft & Needles’ customer service is excellent, and their returns process is quick and easy. The Zenhaven epitomizes luxury. From the plush feel to the 100% natural materials, this mattress is as good for the environment as it is for your back. The main part of the Zenhaven mattress is made from natural Talalay latex. Latex has a couple of advantages over memory foam when used in mattresses. It’s durable, better at conforming to your body shape and it’s quick to bounce back into shape. Rather than sinking into the mattress, the Talalay latex feels almost buoyant. It’s supple, yet supportive, whatever your sleeping position or weight. The Zenhaven has five different density zones, providing firmer support under your torso and shoulders and lighter support elsewhere, for better spinal alignment. You can also choose from two different comfort levels: luxury plus (medium firmness) or gentle firm (for added support). Another big advantage of natural latex is its eco credentials. 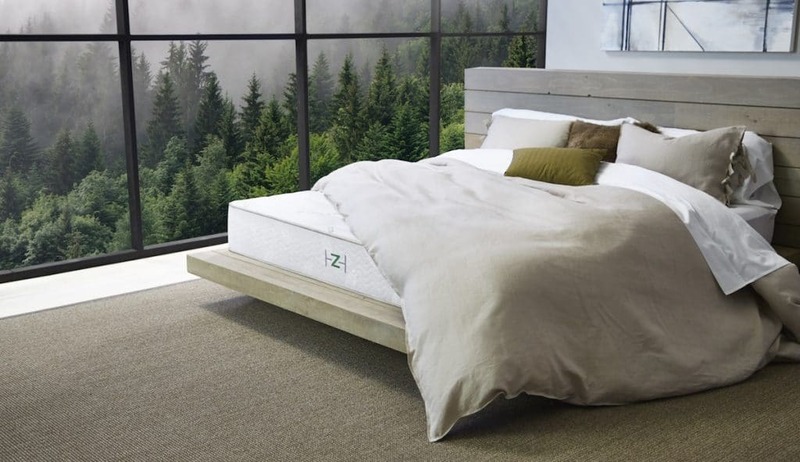 Natural latex, such as that used in the Zenhaven mattress, is harvested from rubber trees, meaning you avoid the chemicals present in synthetic or petroleum-based foam. Not only is this eco-friendly, but it’s also better for indoor air quality – you don’t have to risk breathing in any nasty VOCs. To add to its quality and green credentials, the Talalay latex used in the mattress is made right here in the USA, rather than being imported. That means fewer transport miles and a top-quality product. Do you tend to overheat at night? Where memory foam mattresses can leave you sweating, latex’s open cell structure is naturally more breathable and stays cooler than traditional memory foam. The process used to transform the rubber sap taken from a tree into Talalay latex results in seven times more airflow than you find in Dunlop latex, which is often used in cheaper mattresses. Both sides of the mattress have a layer of New Zealand wool which is naturally breathable and excellent at wicking moisture away. With an outer organic cotton cover, even the sweatiest sleeper should get a dry night’s sleep. One thing to note is that the Zenhaven requires a solid platform, such as a foundation or firm box spring base. It’s not recommended to use the mattress with a slatted bed base. The Zenhaven offers a long 120-day trial period and a 20-year warranty, so you can be confident that you’re buying a top-quality product. As you may expect, this comes at a price. The Zenhaven is an expensive mattress compared to others in this review, but in our opinion, a great night’s sleep is priceless. 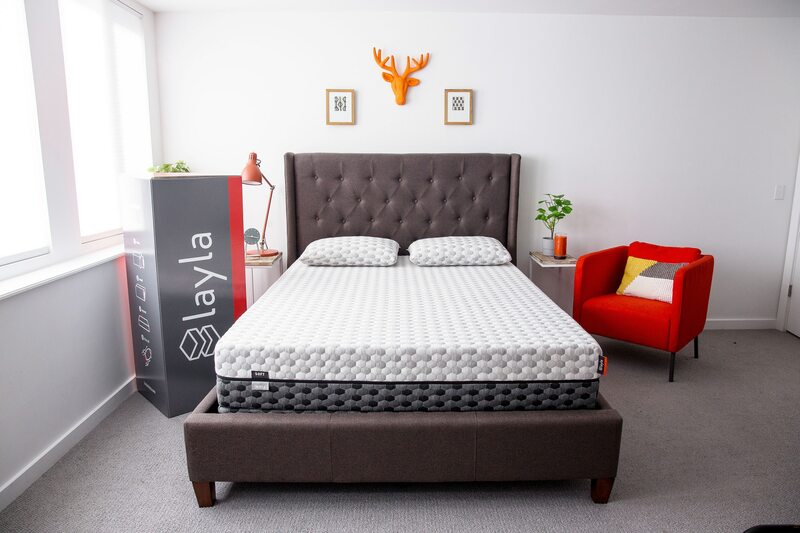 If you’re not quite sure how firm a mattress you want, the double-sided design of the Layla mattress may be a good compromise. Side sleepers may prefer sinking into the softer side, which has a 3-inch layer of memory foam and a firmness rating of 4.5 out of 10. If you sleep on your back, you may want to flip the mattress over to the firmer side (rated 7 out of 10) which will give better support for lumbar scoliosis sufferers. While it’s great to have the option to flip the mattress over, as it weighs 70 lbs, this is definitely a two-person job. This may prove frustrating, particularly as the mattress suits lighter sleepers (many heavier people find even the firm side isn’t firm enough) who may have less muscle power. Both layers of memory foam provide variable support. This means the Layla is firmer around the top part of your body (which is heavier) and at key compression points, such as your shoulders and hips, to help maintain proper spinal alignment. The layers of memory foam on both sides are infused with copper. This helps conduct heat away from the surface of the mattress to keep you cool all night. Copper also has antibacterial properties, so you don’t have to worry about bacteria build up. There’s nothing worse than sleeping next to a person who tosses and turns all night on a mattress where you feel every movement. Even if you don’t wake up, the movement can disturb your sleep. The central support foam layer in the Layla mattress is designed to reduce motion transfer making it an excellent option for restless sleepers or people who like to switch sleeping position during the night. Unusually, this product comes with a lifetime warranty for manufacturing defects and significant sagging or loss of shape. Similar to the Tuft & Needle, the Live and Sleep memory foam mattress is made up of two layers. The 2.5-inch top layer is designed for comfort and cushioning, with the bulk of the support coming from the thicker high-density foam layer underneath. Although it’s a synthetic product, Live and Sleep’s foam is manufactured using an eco-friendly process that uses fewer chemicals. The means the mattress has low VOC emissions (good for indoor air quality) and is relatively environmentally friendly. It’s rated as a medium-firm mattress (6-7 on a scale of 1 to 10), and from user reviews, it’s on the firm side. This should suit back sleepers, but if you don’t weigh much and prefer to sleep on your side, you may find the top layer doesn’t provide enough cushioning for you. The soft knit cover is breathable and can be removed for cleaning. Although Live and Sleep claim the open cell structure enhances breathability and has a cooling effect, it’s still a lot warmer than other mattresses we looked at. This may not bother you, but if you sleep hot, or struggle to sleep during the summer months, you may want to consider something like the Layla mattress instead. Where this mattress really wins is in value for money. Despite its budget price, the materials and quality are good. It may not be as luxurious as the Zenhaven or as cool to sleep on as the Loom & Leaf, but for many scoliosis patients, it will provide the comfort and support you need for a fraction of the price. As a bonus, you get a free memory foam pillow thrown in. The Live and Sleep mattress does come with a money-back guarantee, but it’s worth noting that the trial period is only 30-days. The 20-year warranty covers manufacturing defects but not what it terms “normal” softening of the memory foam. At 12-inches thick, the Loom & Leaf mattress is one of the thicker types on the market. This and its quilted organic cotton cover give it a luxury feel. The Loom & Leaf is made up of four layers, plus a luxury quilted cover. The high-density base layer provides a supportive foundation, with a transition pad separating it from the 5 lb visco-elastic memory foam layer that molds to the contours of your body. But what sets this mattress apart from others is the top memory foam layer. A “gel-swirl” construction helps evenly distribute heat, creating a cooling sensation and the foam layer is designed to maximize air circulation. Laminated onto this is a cooling gel spinal panel. This focuses on cooling the lumbar region – typically the part of your body which retains heat. This may sound quite technical, but in short, the Loom and Leaf contains technology that’s specifically designed to keep you cool at night. If you hate waking up sweaty or you live in an area where the summers are hot, this could make a huge difference to your quality of sleep. You have two options when it comes to firmness levels. The “relaxed firm” comfort level is rated 5-7 (on a scale of 1-10) with a firmer option for people who need or prefer a very firm mattress. Both mattresses are good at absorbing movement, so you shouldn’t have your sleep disturbed by a restless partner. Unlike most foam mattresses, the Loom & Leaf doesn’t come vacuum sealed in a box. It’s delivered uncompressed and installed by professionals. As it’s not rolled up, this means you don’t get the off-gassing odor many memory foam mattresses produce, and you don’t have to wait for it to take shape before sleeping on it. Professional installation also means you don’t have to worry about lugging a heavy mattress up the stairs – great for people who live alone or have mobility issues. 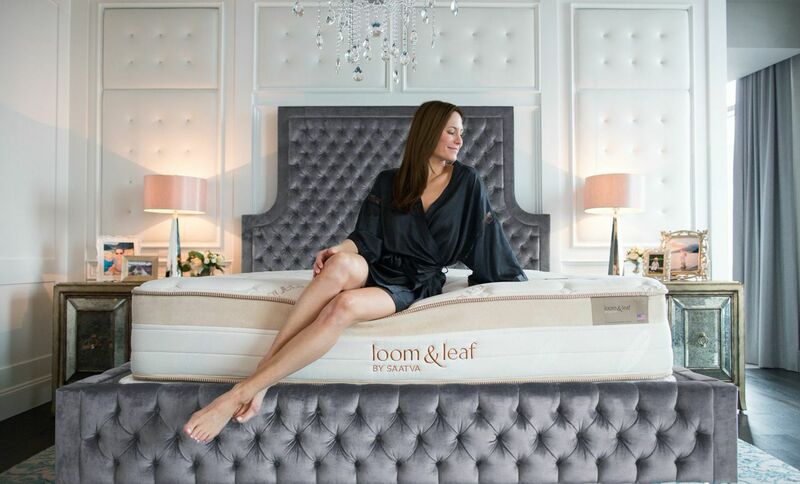 The Loom & Leaf comes with a 15-year warranty and a 120-night sleep trial. 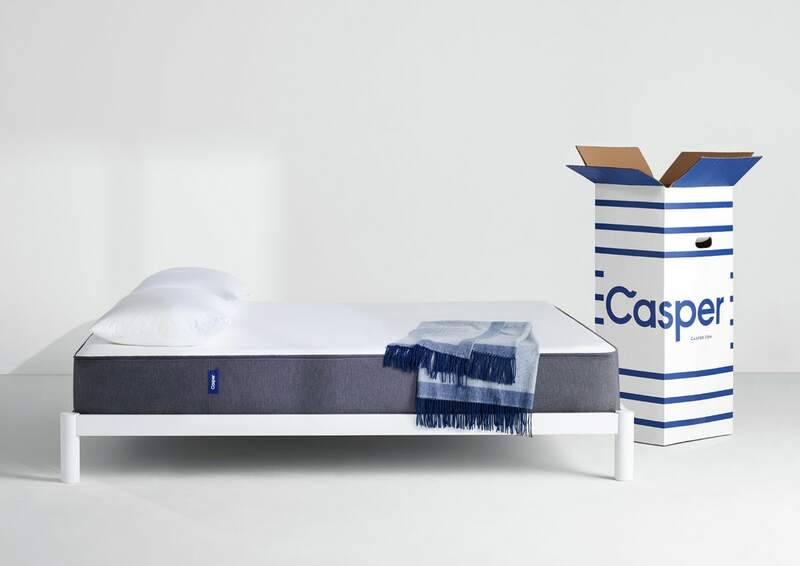 The Casper is a popular mid-range memory foam mattress that’s a good all-around option and particularly effective at preventing motion transfer. The Casper has a four-layer construction. The top is a thin, breathable foam that feels soft and bouncy – a bit like latex. The next layer down is the memory foam, which provides pressure relief and helps prevent motion spreading through the mattress. Below that is a transition layer and then the large base support. The fact that you have a breathable open cell foam on top of the memory foam helps circulate heat, preventing it from building up in the memory foam layer. It works surprisingly well for such a simple design. The mattress has a thin zip-off cover with a dotted pattern that’s machine washable. The foam is designed to be firmer under your hips and core and softer at your shoulders. This is perfect for side sleepers, as mattresses often feel too firm for your shoulder to sink in properly. That said, as it only comes in one firmness rating, heavier people may find it doesn’t provide enough support. The Casper is made purely from synthetic materials which may or may not bother you. You will get some off-gassing when you unpack it, and some users have reported that this smell can linger, but the foams are Certi-PUR-US and Greenguard Gold certified, meaning they have low VOC emissions. The Casper comes with a 10-year warranty and a 100-night trial period. The Saatva mattress is a bit different to the others we’ve reviewed here. Rather than being pure foam, it’s a hybrid model, with a traditional coil system topped with memory foam. This makes it more durable than pure memory foam mattresses, but it retains some of the pressure-relief benefits. When it comes to choosing the best type of mattress for scoliosis, the Saatva comes very close to topping the list. It has been specifically designed to help relieve back pain suffering and has the seal of approval from the Congress of Chiropractic State Associations to support its claims. Active wire support in the center of the mattress helps support the lumbar zone, particularly if you sleep on your back, and the memory foam layer affords pressure relief for your lower back. Added to this is a thick pillow-top layer which helps cushion your back, hips, and shoulders. Another feature of the Saatva which you won’t find in most memory foam mattresses is a perimeter edge system. This is essentially a harder layer of foam which encases the mattress. If you tend to sleep at the edge of your bed or find a firm edge helpful to get in and out of bed, you’ll really notice this extra support compared to other mattresses. The coil system means there’s good airflow through the mattress so you won’t get as hot sleeping on it as you would with a memory foam option. The Saatva also has excellent environmental credentials. The coils are made from recycled steel, it uses natural thistle rather than chemicals to make the fabric flame-retardant, and the foam contains no toxic chemicals and low VOCs. If you’re looking for a mattress that will last you for years to come, or you’re unsure if you want a memory foam or spring mattress, the Saatva is a durable option that offers the best of both worlds. The Tuft & Needle gets our vote for the best mattress for scoliosis patients. It will suit most shapes and sizes of people and is firm enough for back sleepers while not being too uncomfortable for side sleepers. It’s also very affordable and comes with a generous 100-night money-back guarantee, so you can be totally sure it’s the right mattress for you. If you have scoliosis, finding the right mattress is just the first step on the road to a good rest. It’s worth figuring out what other sleeping aids can help you get into a comfortable sleeping position before you test your new mattress so you can properly compare it to your current model.